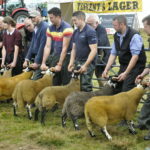 THIS year’s Lorn Agricultural Show may have been at an unfamiliar new venue but there were very familiar names on the prize list. Having been moved on from its recent home at Dunstaffnage, the Lorn Show Society admitted it was fortunate to find a suitable venue and was grateful to Hugh MacColl, Glencoe, for use of the Keil Crofters Common Grazing at Tralee, Benderloch. The society also got lucky with the weather last Saturday, as blistering sunshine greeted an attendance that was almost 50 per cent up on last year’s event. The North Lorn community welcomed the show back to the area after an absence of more than 30 years and embraced the spirit of the day, with many locals volunteering to set up the showfield and run stalls.